The ivy tree is a usual plant in that it's the result of a cross between two genera, the English ivy (Hedera) and Fatsia japonica. The resulting hybrid has the Latin name of Fatshedera. It has the interesting and lovely leaf shape of the Fatsia, which can be seen growing along the roadsides throughout the tropical world, and the cultural requirements and basic climbing habit of its ivy parent. Fatshedera does not grip like a true ivy, however, and will need to be staked up. Once properly staked, the plant's stems will go quite long and form a really interesting border to a bright window. Also from its ivy parentage, it inherited a fondness for cooler temperatures, relatively high humidity, and a more open growing habit. In general, if you can grow successful ivy, you will be able to grow outstanding Fatshedera. Light: It will thrive in anything from bright light to light shade in the summer and slightly dimmer light in the winter. It doesn't like direct sunlight, but dappled sunlight is fine. This is a cool-room plant with a maximum winter temperature of around 70 F.
Water: Keep the soil moist in the summer growing season and slightly drier in the winter. Do not water with warm water and mist occasionally to raise humidity. Fertilizer: During the growing season, feed weekly with a weak liquid fertilizer that includes micronutrients and encourages blooming. These are relatively high feeders and will respond well to ample fertilization. Soil: A light, the fast-draining potting soil is perfect. You can use fortified soils. Ivy trees are not grown from seeds as the plants are sterile. According to various sources, the plant was discovered growing in the wild a century ago, and it was enthusiastically adopted by ivy lovers who admired its oversized leaves, somewhat resembling a giant ivy with creamy splashes around the leaf margin. They can, however, be easily propagated from stem-tip cuttings. To propagate, use a rooting hormone for increased odds of success and make sure to provide high humidity. Repot annually at the beginning of the new growing season. When repotting, use fresh potting soil and go up one pot size. Prevent collapse by not exposing the plant to excessive heat after repotting. To achieve a bushier effect for this relatively sparse plant, try planting two or three in the same pot or pinching off the growing tips of emerging stems. There is only one species: the Fatshedera. This hybrid is sterile and cannot be crossed with other species. It is closest genetically to the common English ivy and the warm-weather Fatsia japonica. 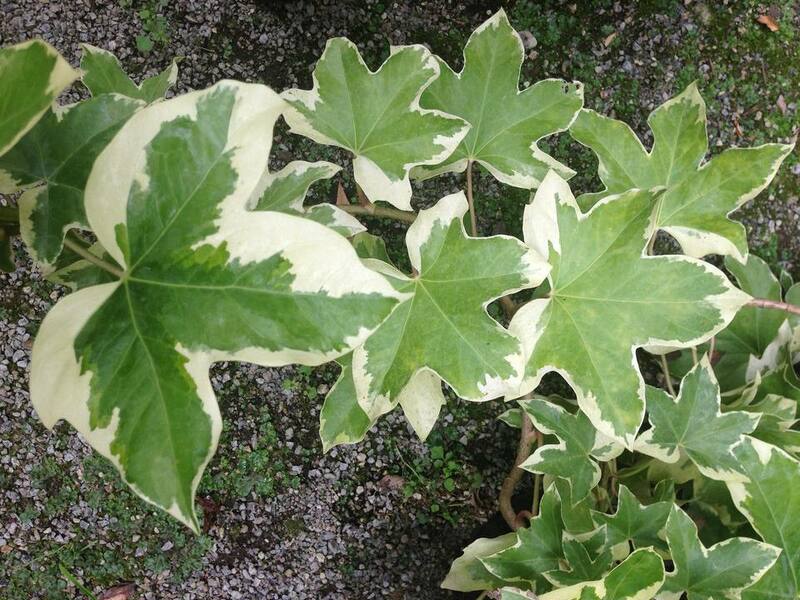 There are several varieties available with increased leaf variegation or larger cream-color splotches on the leaves. Just as with ivy, the key to growing these successfully is to provide plenty of humidity in a cool environment. Overwatered plants tend to drop their leaves or the leaves will turn yellow, while plants that are exposed to hot, dry air will turn brown and drop their leaves. The level of variegation can be influenced by how much light you provide. The more light, the stronger the variegation. All-green varieties need less light and therefore are considered are a bit easier to grow. These plants are vulnerable to spider mites, aphids, and mealybugs. Look under the big leaves for signs of infestation, or look for crinkling or curled leaves. Treat infestations early to prevent the pests from spreading to the whole plant or to your other houseplants. If you don't have room for a climbing plant, pinch off the growing shoots to encourage a shrubby growth habit.